For over 13 years, the Dietronic SRL company has been dealing with the controlled lubrication of sheet metal. The evolving technology of lubricants used in metal forming, has led our company to develop customized solutions for every need. The need for solutions that are more environmentally friendly has allowed us to develop systems that can optimize the application of lubricant to the plate with a huge reduction in fuel consumption, and consequently to benefit from all the critical consequences caused by excessive application of lubricant in the production cycle after deformation. In addition, the advantages of uniform, constant and repeatable application has raised the standard of quality of the final product, while at the same time reducing the energy levels needed for the realization of the molded part. In the field of metal forming, application and type of lubricant used are important factors, as well as the quality of the finished piece for a reduction of wear of the molds, which is a very critical factor in this application. Spray Lubrication Systems provide a highly efficient method of applying lubricants and corrosion protection fluids. In addition to luricating blanks, pipe sections and stamping or forming tools, wire and bars can also be treated. Precise control of lubricating systems can reduce oil consumption by up to 90% and can elminate time consumping cleaning of parts. The EPC 4 or 8 Point series are metal spray lubrication machines which can deposit adjustable films of lubricant at desired points. This is done through the use of automatic valves for spraying of various models equipped with quick connectors for connection to the control unit. The standard control unit consists of 4 or 8 outputs for connecting up to 4 or 8 spray valves in addition to the 30-litre lubricant tank, complete with a comprehensive visual and electrical indicator of mimimum levels, as well as a system to filter out any impurities. The electrical control unit comes complete with an electric cabinet on which the operator interface keyboard is found. The operator interface consists of a 3-inch touch panel where the nozzles are selected for each active channel (up to a maximum of 8). 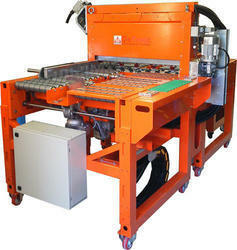 The EPC standard lubrication spray machines are housed in a position to deposit adjustable films of lubricant. Our machines are made to use automatic valves spaced at 100 mm spraying KA2. 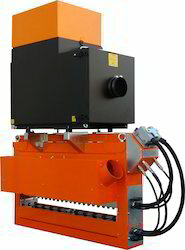 The automatic spray valves are fed within a structure cased in varnished metal at 100 mm intervals. The structure is designed for connection to a vacuum system. The connections of the structure containing oil-pneumatic valves and the spray tub assembly is made using connectors for quick connection. The product is fed through an air pump housed in the spray the tub assembly group and the amount of product applied to the plate by spraying valves is adjusted by an air flow regulator. The management of air atomization spray valves is through precision pressure regulators, including a pressure gauge, that allow complete control from 0.2 to 0.8 bar depending on the viscosity of the product. The extraction of the carrier nozzles allow manual adjustment of each spray valve through a screw placed at the top of the KA2 valve. The selection of the active spray valves is done through a pneumatic island mounted at the bottom of the tub assembly. The standard control unit is composed of a 30 liter oil tank, which includes a minimum visual and electric level indicator and a filtration system for any impurities. The electrical control unit includes an electric cabinet on which the operator interface keyboard is found. In the case of the LCP series, the structure is designed to minimize the overall dimensions in depth (200mm) to fit even on lines where available spaces are reduced, and also has an integrated aspiration chamber. 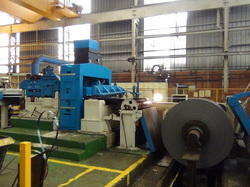 DieTronic SRL has built this unit for 400 to 2600 mm width equipments. The ability to vary the amount of lubricant is determined by the use of valves with adjustable frequency, for each nozzle, integrated into the manifold. The control unit, which is integrated into the lubricant reservoir, is equipped with an 8-inch touch keyboard, where all the lubrication parameters are set - such as the width of the surface to be lubricated, the oil amount separately for each side of the plate, spraying air pressure and lubricant temperature. All these parameters can be memorized through an alphanumeric code. The use of LCP series of coils provides a system for lifting the upper spray head for easier exchange of conveyor, as well as a non-motorized roller at the bottom, which accompanies the sheet during its movement within the lubrication system. 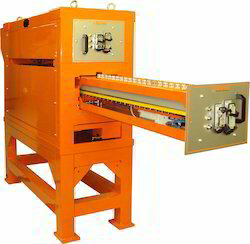 When using pre-cut squares with LCP EJ Series, the machine can be equipped with an adjustable speed motorized transport roller conveyor, within the lubricating system, for product sizes of less than 300 mm. The MCPX series are machines for spray lubricating on the sheet metal, capable of depositing films of lubricant adjustable from 0.3 up to 10 g/m2. This is done by using a series of collectors 200mm in length, which house the LVLP spray nozzles at every 50mm. The manifolds are designed to channel the pulverization airflow at a very low pressure (0.2 to 0.8 bar), the housing of control valves for each nozzle and the oil heating temperature maintenance system incorporated in the manifold. The series of collectors are placed in a box in an isolated removable piece of carpentry, which is in turn housed within a load-bearing structure where there is a pneumatic lifting system of the upper box to facilitate insertion of the plate. All the structures of our machines aredesigned for connection to an oil mist exhauster. The feeding and management of the quantity of oil is through the variable frequency drive of the solenoid valves of the oil, designed and produced by Dietronic. The separate management allows using different amounts of lubricant between the top and bottom. The connection system for all the electrical/pneumatic/hydraulic connections is designed connect the spraying box and the tank, which includes a control panel, allowing for very rapid installation. 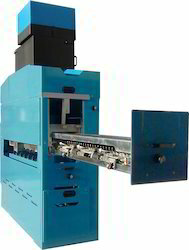 With the SAGOMA series machines, the lubricant can be applied to different areas and adjustable quantities are used only in pre-cut sheet metal machining for square sheets ranging from 400 to 4000 mm. As the series are equipped with LCP manifold with the same features included in the pull-out spray heads, the amount applied is determined by the volumetric pump for each individual nozzle, by means of motorized pumps with brushless motors. In this case, the amount applied for each zone, whose minimum size is 50x50 mm, can be set in mg/m2. Sector Spray Lubrication System (SAGOMA) is used for Household Appliance, Automobile Skin Panel, Refrigerator & Washing Machine Skin Panel, etc. 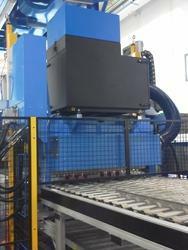 DieTronic SRL has built this unit for 4000 mm width sheet feeding. Die Tronic SRL has suippled complete system of Sector Spray Lubrication System (SAGOMA) with conveyor roller for easy entry & exit of the sheet. Dietronic SRL provide precisice control of lubircation to Rolling Mills with it Electronic Spray System (MCPX). This is the ideal substitute for Electrostatic Spray Lubrication System. DieTronic SRL has introduce a special product for Lubricating Sheet or Strips for Household Appliance, Automobile Skin Panel, Refrigerator & Washing Machine Skin Panel, etc. 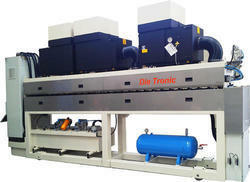 Looking for Spray Lubricating System from DieTronic, Italy ?